He gets the request you make done! I have been trying to get a job for over two years. I burned like numerous Good Job candles with no results. I did a Road Opener and saw little results. Well finally, I got tired and burned a Eleggua candle through Dr. E's site and...BOOM! Eleggua eliminated every blockage! That is when I got an interview finally and they said I was at the top of the list for dibs on the job. 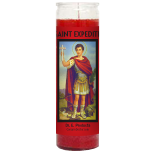 Well, I wasn't playing around I needed this job, so I got a St. Expedite candle burned ...and 3 days later, I was called and offered the position! I said YES! So, you are doggone right I gave him the big ol' pound cake and the glass of water he wanted immediately! It's a very small offering to ask for, for doing me such a huge favor! THANK YOU SAINT EXPEDITE! THANK YOU DR. E LEGACY! Date Added: 01/23/2015 by A. S.